While Pokémon’s main draw will always be its ever-expanding stable of adorable monsters, you can’t think of the franchise without acknowledging just how cool the Poké Ball is. A high-tech gadget that fits snugly into your hand, the Poké Ball is the most important item on any would-be Trainer’s person. Without it, you’d have no Pokémon collection. And it looks pretty cool, too. Bootleggers are well aware of the significance of this piece of Pokémon lore, which explains the proliferation of illegally produced Poké Balls in online shops. These toys are often inexpensive, tempting some fans into acquiring them. As you’ll see in this article, however, such items are never worth the purchase. If you’ve been reading our blog, you’ll already know that we’re not huge fans of Chinese online marketplaces. This is because they’re often chock-full of cheap yet poorly made counterfeit products. It was from such a store that we bought our fake Pokémon Master Ball. 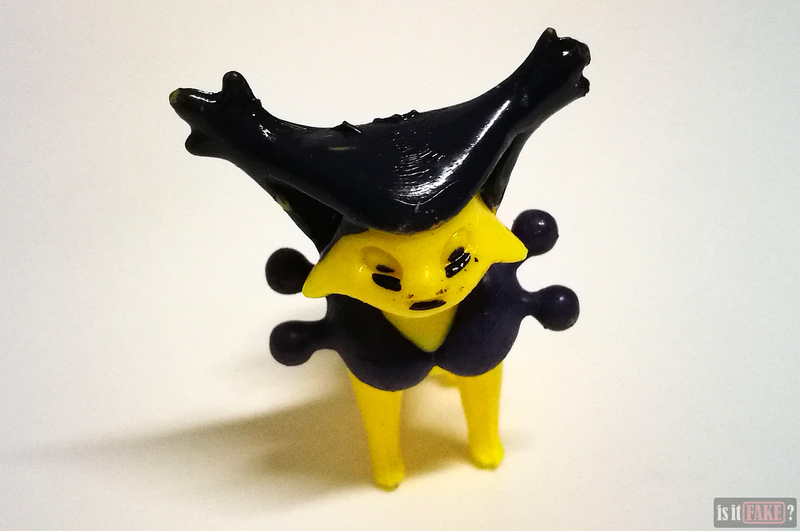 According to the product page, its seller is Eashtoy Store. 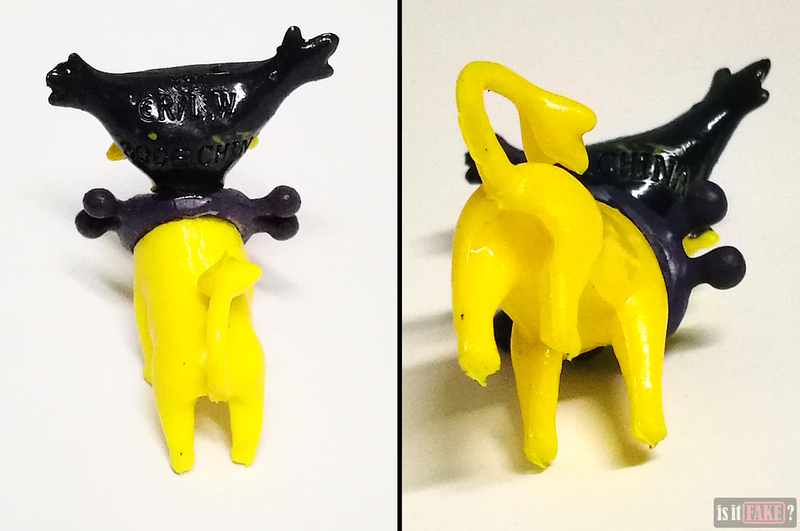 The “brand” behind this toy is DOWIN. A quick Google search will reveal Dowin as the name of several companies. From their websites, you’ll know they’re not engaged in the business of manufacturing Pokémon toys. You will, however, find fake toys, listed in Chinese online stores, bearing the brand. It’s possible the bootleggers are simply using the brand to confuse buyers into thinking they’re a legitimate business. And without a website of their own, verifying their true identity would be near impossible. 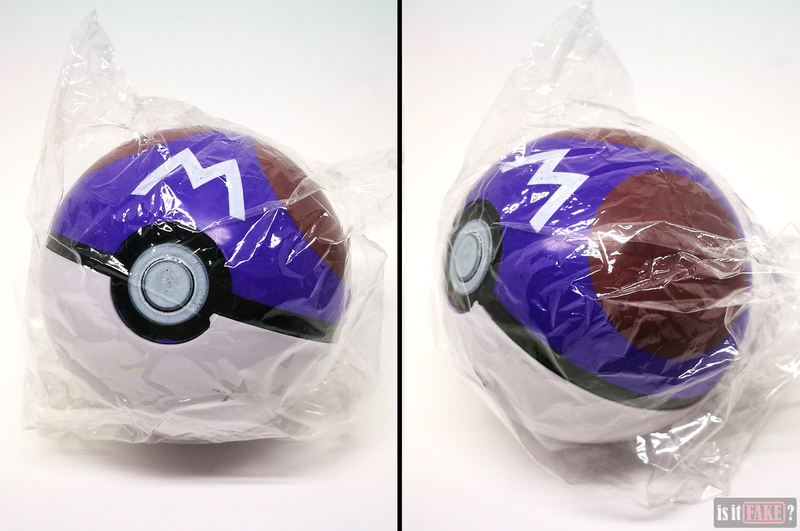 The bootleggers responsible for this fake Pokémon Master Ball are so cheap they didn’t bother to design a package for it. The toy came to us simply wrapped in crumpled plastic that isn’t even sealed. 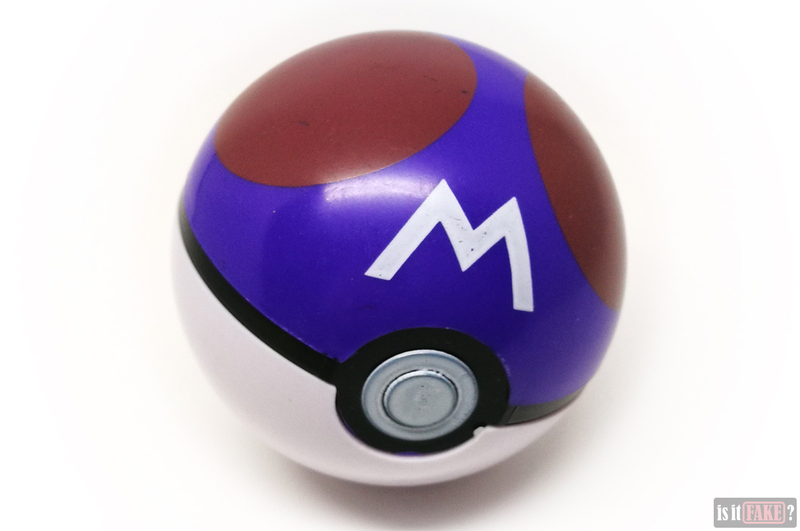 With a light squeeze, you can pop the Master Ball out of the plastic. 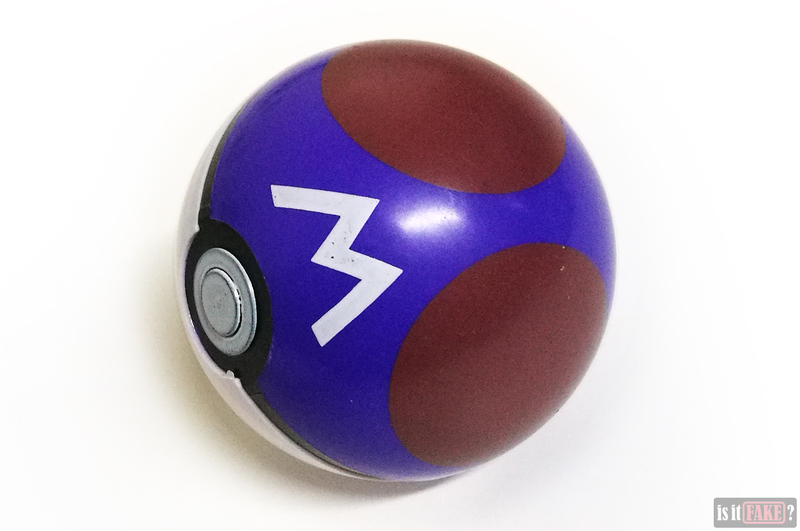 Measuring 7cm in diameter, the Poké Ball is as big as you’d expect it to be. It’s extremely light and makes a thin, hollow sound when smashed against a surface. 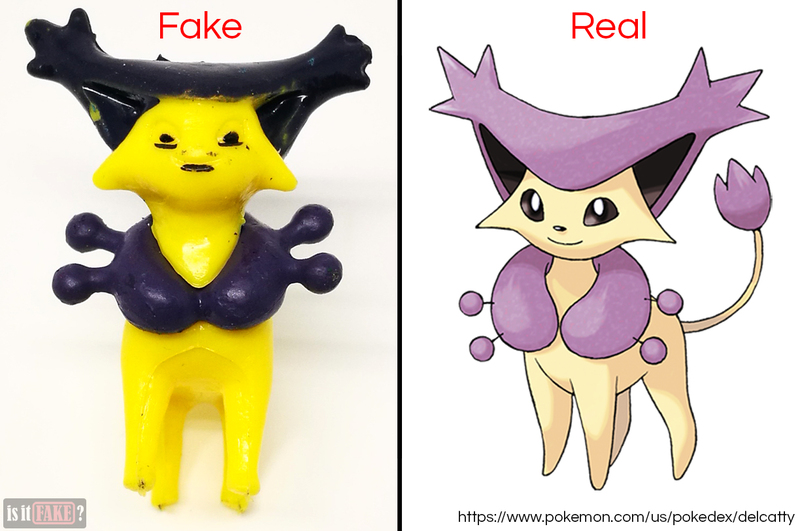 The fake Master Ball isn’t very clean. It’s got blemishes everywhere, such as black smudges, scratches, chipped paint, and two tiny sculpt deformities. The button in particular looks extremely dirty, and it’s not even the same shade of white as the M or the bottom half of the ball. 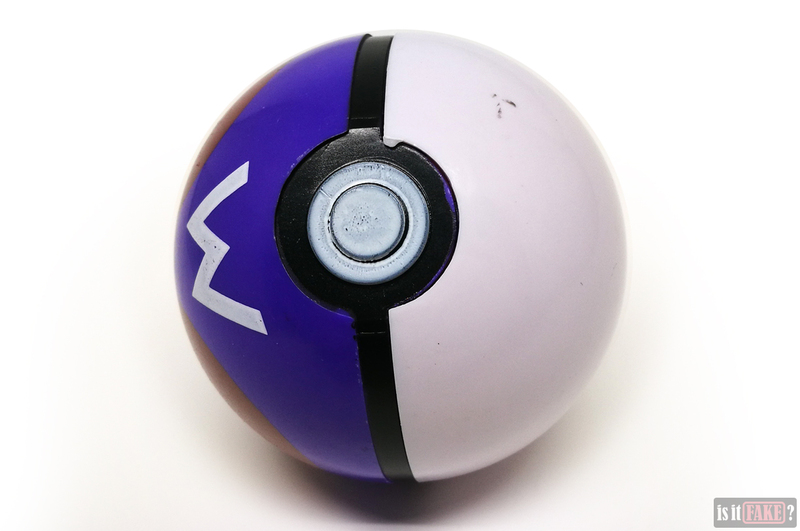 It’s when you press said button to open the Master Ball that you’ll realize just how flimsy the plastic is. 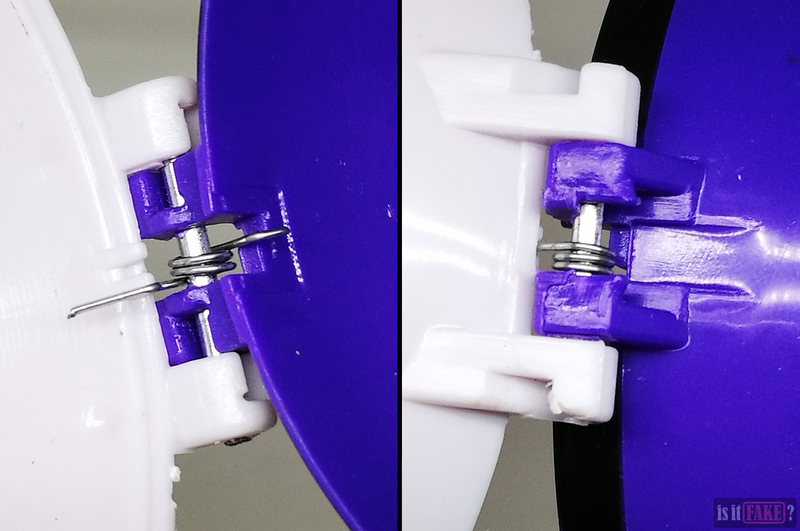 Squeezing the button bends the ball’s purple hemisphere inwards, releasing an interior hook from a notch and allowing the spring mechanism to open the ball. 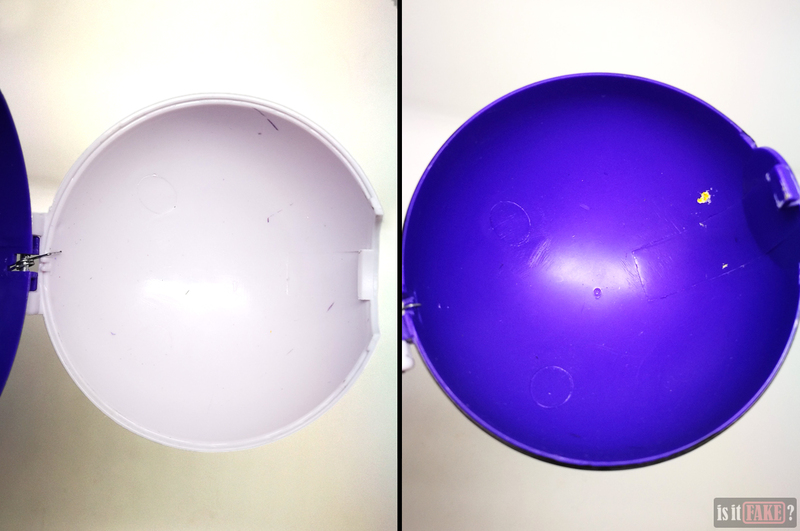 The interior of the ball is just as dirty as the exterior. You’ll also see how thin the plastic is, so much so that even gentle pressure can warp it. The spring mechanism – composed of a thin metal wire, fragile-looking plastic, and a slim metal bar – looks frightening delicate. If the ball ever breaks, and the mechanism flies apart, the wire and bar can be swallowed by small children. 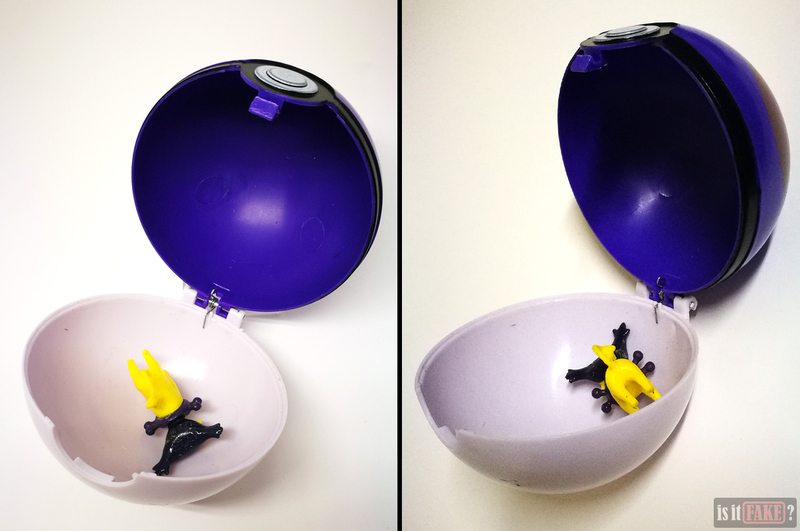 The worst part about opening the Master Ball, however, is seeing the Pokémon figure inside. The creature is ridiculously small, measuring only over an inch tall and long. 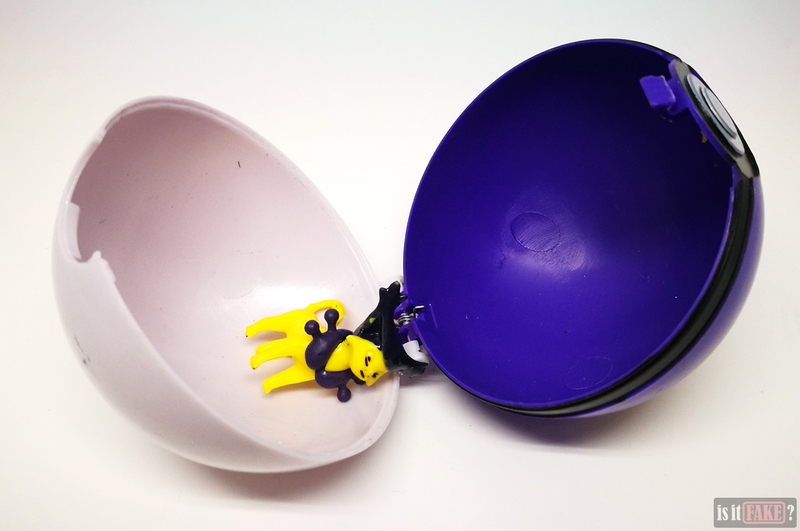 It’s small enough to be swallowed by young children, making it dangerous. There is nothing remotely appealing about it. 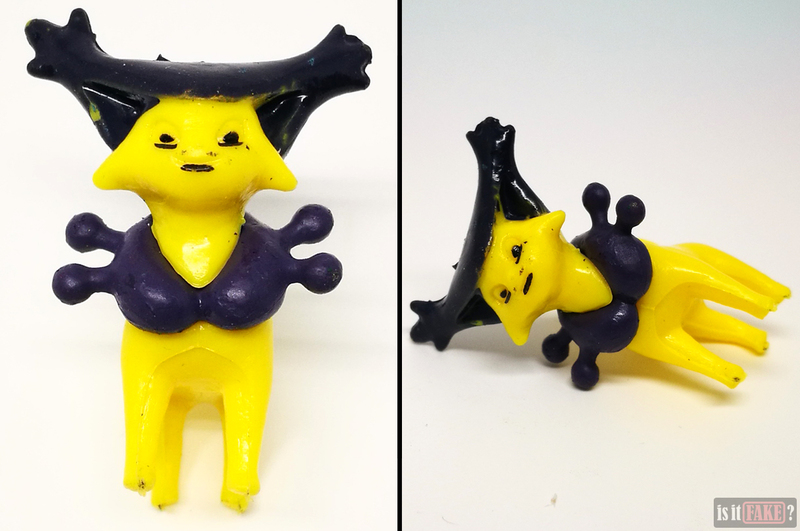 The sculpt and paint are hideous, so that it barely resembles the Generation 3 Pokémon Delcatty that it’s supposed to be. For starters, the colors are wrong – the yellow should be closer to beige, the black should be light purple. Its demonic little mug looks nothing like Delcatty’s cute face. It seems to have been sculpted with a smile, but with the uniformly atrocious paintjob, its expression looks more sinister than anything. The diminutive monstrosity can’t even stand. With all the weight distributed to its head and chest, it’s always tilting over and falling on its face. The plastic is cheap, too. Though the head and body are thick and therefore sturdy, the tail and limbs are soft and pliable. 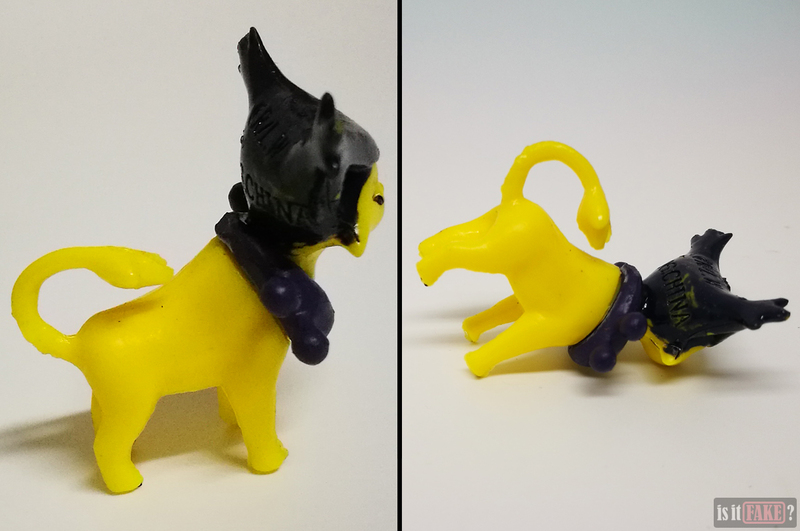 Here’s a comparison between the fake figure and the actual Delcatty. 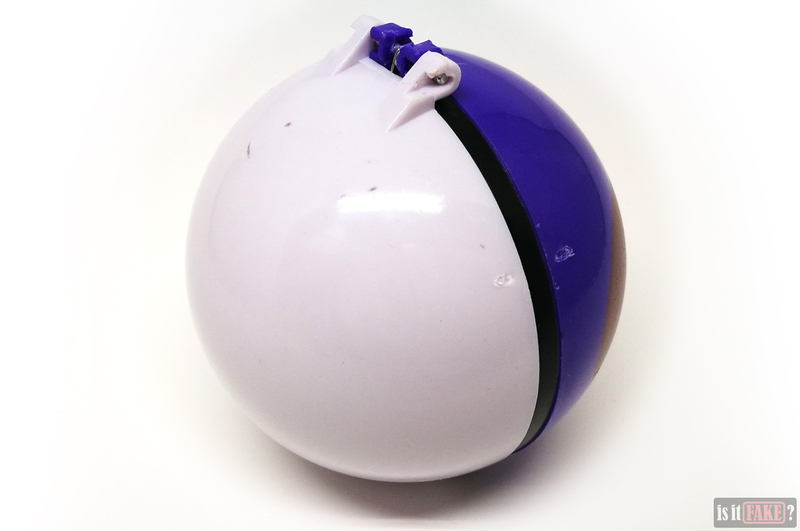 Check out our video below to see more of this fake Pokémon Master Ball. 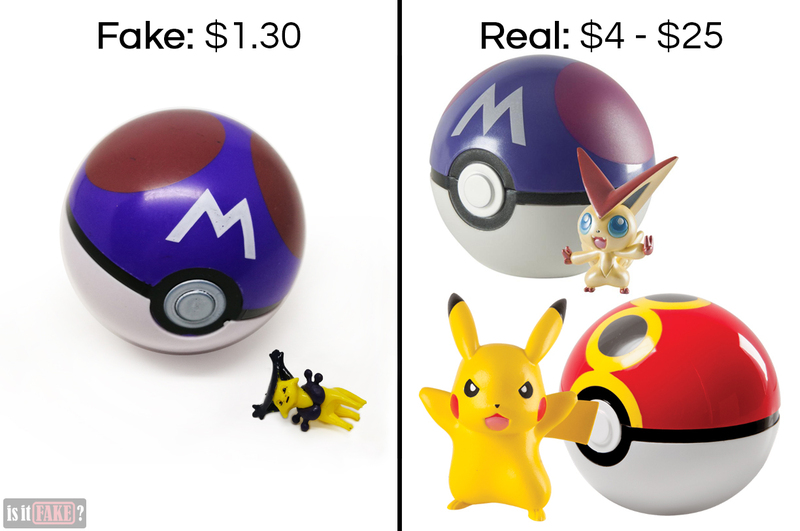 Official Pokémon Poké Balls are actually quite affordable, and are available in many popular toy stores. 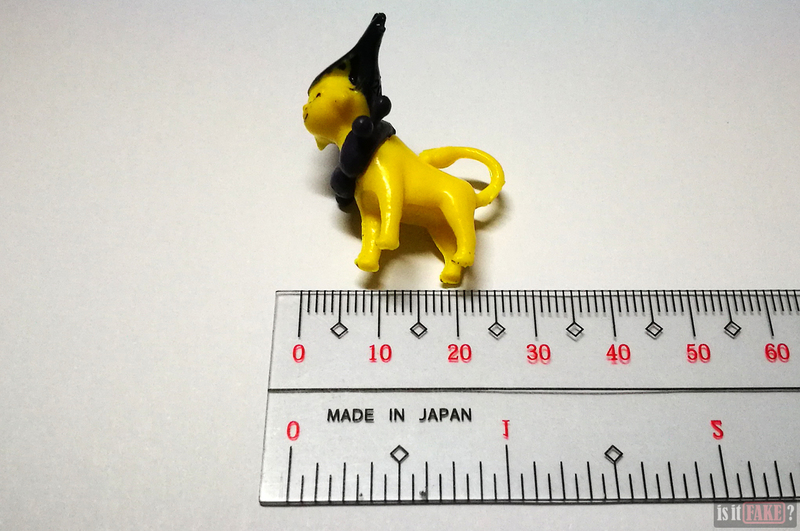 Tomy is currently the most prolific manufacturer of licensed Pokémon toys. These toys are made of durable, high quality materials and feature clean, exact paint applications. 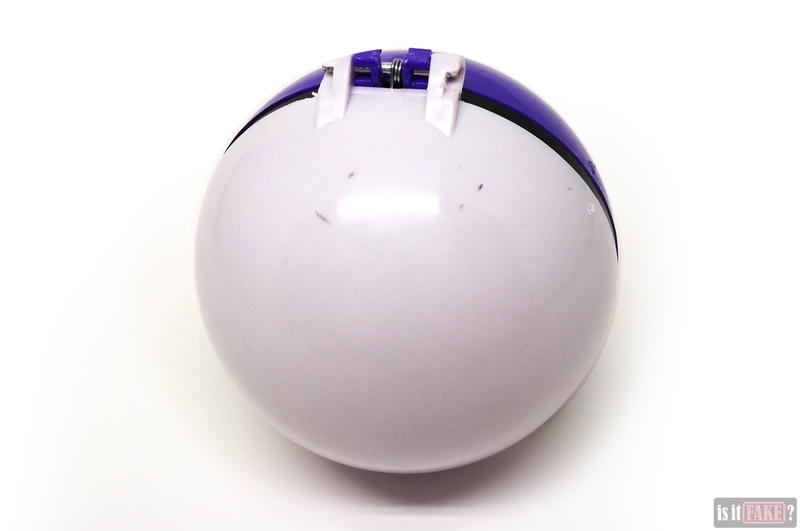 The figure within each ball is just as well-made, and measures 2 inches in height. 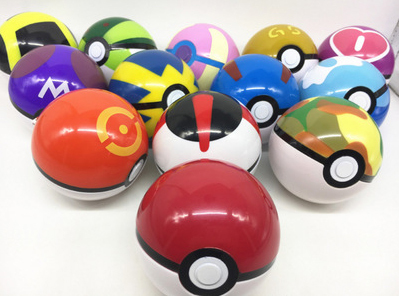 Tomy’s Poké Balls are diverse in color and the type of Pokémon contained within them. The regular type of ball costs $9.99. 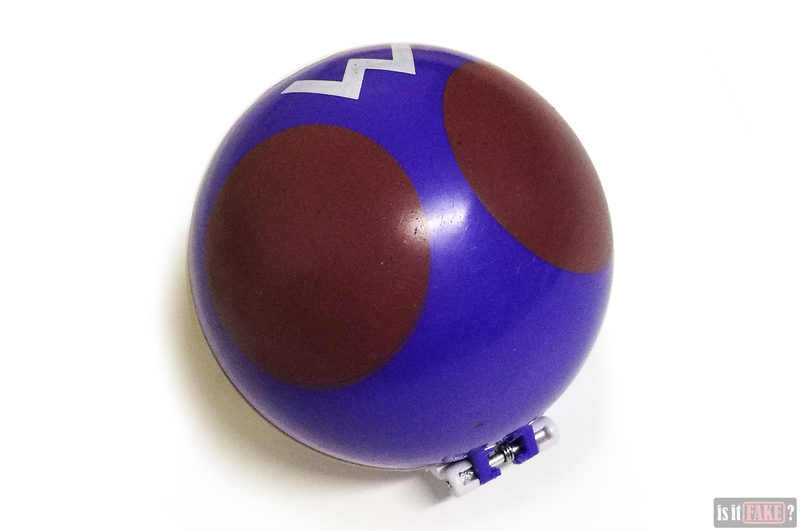 Tomy also produces a special type of Poké Ball called Throw ‘N’ Pop. As the name suggests, this ball can be thrown. Upon impact, the ball pops open, releasing the Pokémon. 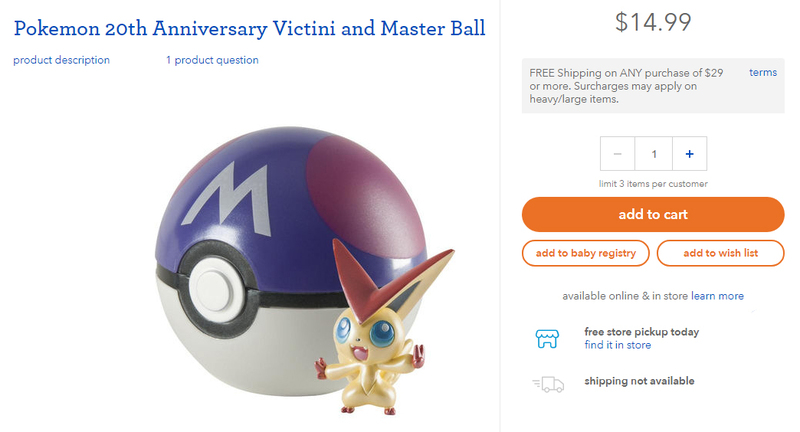 If you’re specifically looking for a Pokémon Master Ball, Tomy has a Victini and Master Ball item that’s available at Toys “R” Us. This is a special 20th Anniversary edition of the toy, so both the ball and the figure have a lustrous, glossy finish. Alternatively, you can buy a less expensive Tomy Master Ball from Amazon Japan. While it’s the cheapest at $4, it doesn’t come with a figure. If you’re interested in other types of Poké Balls, you can buy all sorts directly from Tomy’s online store. This fake Pokémon Master Ball is an excellent example of a cheaply made toy. For that, it gets a far-from-excellent 90% terrible rating.